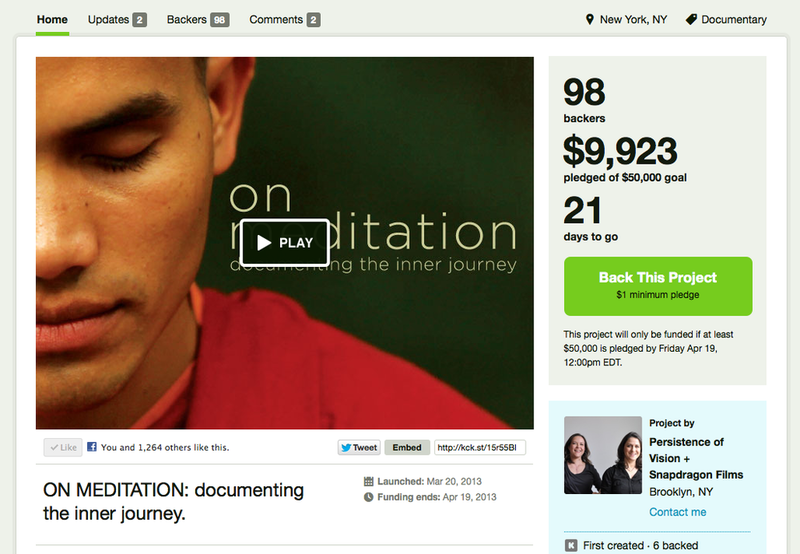 We're amazed by the reaction to the launch of our Kickstarter campaign for ON MEDITATION. In our first week we have raised nearly $10,000 ($9,923 as of this moment!) from 98 backers. Your generous contributions and enthusiastic response has inspired and humbled us. Thank you so much for all you have done to support ON MEDITATION. Now, we need your help for the next stage of the campaign: week two is typically the most challenging stage of a Kickstarter campaign. We are humbly reaching out to you to seek your support as we enter this crucial phase. We need your help to sustain the momentum needed to reach our $50,000 fundraising goal. We must reach our goal in order to receive any of our funding from Kickstarter. A contribution of any amount will help keep the project moving full steam ahead. Moreover, we continue to rely upon our friends and supporters to continue the work you have been doing to spread the word about ON MEDITATION and our Kickstarter campaign. On the production front we had some great news too. David Lynch has agreed to participate and we will be shooting him in late April. Please visit our Kickstarter campaign today to make a contribution and tell your friends and family about this exciting project. Our aim is to elevate the subject matter through well-crafted filmmaking and make the practice seem more accessible to a more mainstream audience and underserved populations. With your help we are on the way to reaching our goal. THANKS AGAIN!! Copyright 2016 snapdragon Films. All Rights Reserved.